Vast blue skies, snow-capped mountains, slithering rivers and wide open plains are the dramatic backdrop of this expansive region. In the heart of New Zealand’s largest region lies Christchurch city, a “garden city” whose economic and cultural identities have changed thoroughly following the 2010 and 2011 quakes. 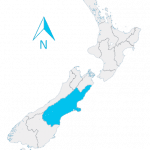 Half-way down the South Island, the Canterbury plains were historically home to several Māori tribes, mainly by the regions’s extensive coastline and around the lakes, due to the abundance of food (fish and eels). Canterbury is traditionally a fairly traditional region. The London-based Canterbury Association aimed to recreate English rural society and sent out different classes of people from the mid-19th century. This contributes to the still-current European, almost English feel as one walks about the streets of Christchurch, although many historical buildings did not survive the recent earthquakes. Sheep farming proved the best option for the economy and an estimated 3 millions heads were roaming about the region as early as the 1860s. This number hasn’t increased much as of 2012, and Canterbury is also known as the granary of New Zealand, with over 60% of the country’s wheat and barley spread across its beautiful plains. If Canterbury was covered in beech forests before European settlement, it is now composed of majestic farmland plains from North to South, flanked with the Southern Alps mountain chain in the West and the Pacific ocean in the East. Outdoor opportunities are all within reach, a mere 2 hours’ drive from Christchurch. It is indeed possible to go surfing in the morning and skiing in the afternoon. One of New Zealand’s driest regions, Canterbury usually experiences mild summers (around 22-24C) and temperatures frequently fall below 0C on winter nights to reach around 10C on winter days. Frosts are common (80-100 times per year), and so is snow in the higher plains or hills at the foot of the Southern Alps. The second biggest urban centre in New Zealand, the “Garden City” of Christchurch accounts for an estimated 65% (375,200) of the region’s population. Out of the quakes’s ruins has emerged the opportunity to completely redesign the city on many levels: cultural hubs, shopping precincts, residential areas, etc. A mixed migrant population from the Europe and Asia has made Canterbury their home already. Although not predominant by the country’s standards, orchards, vineyards and market gardens dot the region. Timber, manufacturing, hydroelectricity, and fishing all offer a decent Canterbury jobs opportunities. Christchurch is the gateway to the South Island for many overseas visitors and tourism accounts for just under 9% of all jobs in the region, similar to the national average. The Christchurch Rebuild has driven the region’s economy since 2011 and created unmatched job opportunities for locals and overseas workers alike, mostly in the trade industry. Carpenters, plumbers, builders, etc. are all in high demand and the Government has relaxed some immigration rules to allow overseas workers to stay longer and move between employers easily. This explains why the region has been recording the country’s lowest unemployment rates. Last but not least, Canterbury has a booming technology sector with major innovation hubs in IT as well as agriculture. Globally-recognised research centres include Lincoln University, Plant and Food Research, Landcare Research, or AgResearch.